Twenty years on from the introduction of the international whaling moratorium that was supposed to protect them, the great whales face renewed and mortal dangers in 2006. A double threat is looming for the world's largest mammals, many of them endangered species, in the coming year. In the biggest whale slaughter for a generation, more than 2,000 animals are likely to be directly hunted by the three countries continuing whaling in defiance of world opinion, Japan, Norway and Iceland. And in a crucial political move, this year the pro-whaling nations look likely to achieve their first majority of votes in whaling's regulatory body, the International Whaling Commission (IWC). The first development will be brutal, bloody and shocking to many people who might be under the impression that whaling is a thing of the past. But the second may be even more significant for whale welfare in the long term, for it would pave the way for an eventual resumption of commercial whaling, which the 1986 moratorium put on indefinite hold. Japan is leading the way on both counts. Its whaling fleet is firing harpoons right now in the Antarctic Ocean, hunting 935 minke whales, more than double the number it took last year, all of them under the guise of "scientific" whaling - killing the animals allegedly for research purposes. This label is a fiction which fools no one, as whale meat, popular with Japanese consumers, is sold on the open market. It is also hunting 10 endangered fin whales - the second-largest animal on earth, after the blue whale - and over the next two years will seek to harpoon 40 more fin whales, and 50 humpbacks, the big whales whose spectacular "breaching" - leaping from the water - delights observers on whale-watching cruises. Norway, which is pursuing commercial whaling openly by simply declining to adhere to the moratorium, is following close behind, with another leap in its planned kills in the coming year. Four days before Christmas, the Norwegian government announced it would increase its 2006 whale hunting quota by a further 250 animals to 1,052, following a unanimous recommendation by the Storting (Norwegian parliament). Iceland, which recommenced whaling three years ago, also under the "scientific" label, killed 39 minkes last year and is expected to hunt a similar number in 2006. That all adds up to by far the bloodiest bout of whale slaughter since the days of full-scale commercial whaling and has greatly angered environmental campaigners. "People should wake up to the scale of what is happening this year," said the whaling campaigner for Greenpeace UK, Willie McKenzie. "Politicians who are supposed to be anti-whaling especially need to wake up to it, and press their governments to put as much effort into saving the world's whale populations as the whaling countries are doing to exploit them." Greenpeace has decided to take the fight directly to the Japanese, and has sent two of its large campaigning vessels, Arctic Sunrise and Esperanza, to the Southern Ocean to try to hinder whaling operations directly. In the past 10 days there have been a series of extraordinary confrontations between Greenpeace and the Japanese fleet, which is based around the factory ship Nisshin Maru. In actions strongly reminiscent of those which first made the group famous in the 1970s, Greenpeace activists in small inflatable boats have been trying to block the harpooners' line of fire and, on a number if occasions, have succeeded - making the idea of Save The Whale a reality. "New Zealand Conservation Minister, Chris Carter, said the IWC vote "means that Japan has no moral authority to go whaling in the southern ocean ... it is a statement that the majority of countries at the IWC do not support scientific whaling ..."
He says it is not about scientific enquiry, it is about an excuse to use international regulations to hunt as many whales as possible to sell the flesh. What especially angers environmentalists is the fact the Japanese hunt is taking place in the Southern Ocean Whaling Sanctuary, an area encompassing 21 million sq miles of sea around Antarctica which the IWC declared off-limits for whaling in 1994. Japan ignores it. Some campaigners are now calling for the anti-whaling countries - the so-called "like-minded" group, led by Australia, New Zealand, the US and Britain - to take legal action against Japan over the "scientific" whaling issue. "Scientific whaling needs to be stopped, and legal action needs to be taken against Japan in the International Court," said Joth Singh, director of wildlife and habitats for the International Fund for Animal Welfare. "We believe there is, in fact, an opportunity to do that, and we have contracted a lawyer in Australia who has done an evalutation of the possibilities of legal action. We think the like-minded countries should look at them. "They need to take this issue to the International Court, because international pressure is required. Trade sanctions should certainly be a possibility." Mr Singh added: "I have been attending IWC meetings for years, and a number of resolutions which have been passed aimed at stopping scientific whaling have had no effect whatsoever. Diplomatic demarches, notes to Japan, have had no effect either. "If there is any seriousness in terms of saving whales, this seems to be the way." But time is pressing if the anti-whaling countries want to act, because in June, at the IWC meeting to be held in St Kitts and Nevis in the Caribbean, the whaling nations seem likely to secure a voting majority for the first time. It would be the result of an intense diplomatic campaign by Japan to get small developing countries to join the IWC and vote in its favour, by offering them substantial aid. Over the past six years, at least 14 nations have been recruited to the IWC as Japan's supporters, most of which have no whaling tradition. Some of the newcomers, such as Mongolia and Mali, do not even have a coastline. Mark Simmonds, international director of science for the Whale and Dolphin Conservation Society, believes the Japanese already had their majority at last year's IWC meeting in South Korea but administrative hitches meant they were not able to exercise it. This year, he thinks, they will. "This would be the most enormous setback for whale and dolphin conservation," he said. "People don't realise how significant it is and how close it is. The world needs to be alerted to it." The whaling moratorium, voted through at the IWC meeting in Brighton in 1982 and brought in four years later, has been a rare environmental success story. It was intended originally, not as an outright and permanent ban on whaling, but as a pause to give whale stocks time to recover while their numbers were assessed comprehensively, and new ways of managing hunting were introduced, based on the close study of whale population dynamics. Most anti-whaling countries, including Britain, are now firmly of the view that commercial whaling should never resume. Britain's original position was to be "guided by the science" but that view has hardened over the years, and the UK now believes "that properly regulated whale watching is the only truly sustainable use of whales and other cetaceans [dolphins and porpoises]". Copyright © Independent News & Media. This article was first published in The Independent 2/1/06. The smallest of the great whales, usually about 35ft long and weighing about nine tons. This is the whale that is most commonly seen around the coasts of Britain and it is the main object of the summer whale hunt by Norwegian and Icelandic boats. Slightly larger version of the North Atlantic minke. Because it was the smallest, it was targeted last during the centuries of commercial whaling, so it is still relatively abundant. The main target of the Japanese whale hunt, for "scientific" reasons. 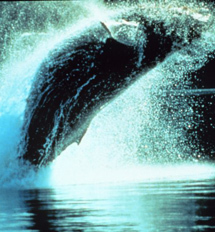 The second-largest of all the whales, exceeded only by the blue whale. Can be 75ft long and weigh 75 tons. Despite its classification as an endangered species - the result of commercial whaling, especially in the southern hemisphere - it is now being hunted again by the Japanese. Medium-sized whale, typically 45ft long and weighing 30 tons, widely distributed from the Arctic to the Antarctic. This species is probably the best known, and most photographed, because of its habit of making spectacular leaps out of the water. Heavily exploited in the past, it is now recovering in many places thanks to the whaling moratorium, but it is again being targeted by the Japanese.